For the second time in as many nights, the Charlotte Stone Crabs outlasted the Brevard County Manatees in a 21 run slugfest. 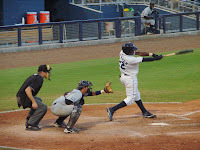 The Stone Crabs scored a season high 12 runs to defeat the Manatees 12-9 on Friday night at Charlotte Sports Complex. Tim Beckham continued to prove that his hitting slump is behind him by going 4 of 5 driving in three runs and bringing his batting average up to just below .200 on the season. Brevard County jumped out to a big lead in the first inning by striking for five runs in the inning. The Manatees offense was aided by wild pitching by Stone Crabs starter Chris Andujar who struck a batter and walked two in the inning. Mat Gamel picked up two RBI's with a double to center, Josh Prince singled home a run, Anderson De La Rosa drew a bases load walk to score Sergio Miranda and Josh Prince scored on a passed ball for the Manatees five runs. The Stone Crabs pulled back into the game in the bottom of the first. Leslie Anderson hit his second home run of the season, shot to right field that scored three runs and pulled the Stone Crabs to within two runs of the lead 5-3. The Manatees picked up another run in the second inning. Matt Cline reached base after being hit by a pitch. Cline was taken out of the game afterwards and replaced by pinch runner Sean Halton who would later score on an RBI double by Erik Komatsu to give them a 6-3 lead. But it was in the fifth inning when the Stone Crabs struck with a five run inning of their own. Matt Spring led off the inning with a double to right and then advanced to third on a wild pitch. Kyeong Kang then drew a walk. Matt Hall followed with an RBI single to score Spring. Isaias Velasquez then laid down a sac bunt that was thrown away by the Manatees pitcher, allowing Kang to score and all runners to advance into scoring position. Beckham drove home the tying run with an RBI single to score Hall. Matt Joyce and Henry Wrigley each added RBI's to increase the Stone Crabs lead to 8-6. Both clubs exchanged runs in the sixth and seventh innings. The Manatees picked up a run in the top of the sixth with an RBI single by Kentrail Davis to score Shawn Zarraga. The Stone Crabs matched the run in the bottom of the seventh with Wrigley driving home Beckham with a ground ball to second. The score was now 9-7, Stone Crabs on top. The Stone Crabs added some insurance runs in the bottom of the eighth inning. Kang and Hall collected RBI doubles and Beckham drove home his second run of the game with an RBI single to give the Stone Crabs a 12-7 lead. The Manatees rallied in the ninth to move closer to the lead. Miranda and Prince each knocked home a run but the Stone Crabs closed the door to secure the 12-9 win. Thanks to the offensive explosion Andujar (4-1) recording the win, allowed 7 runs on 9 hits in 5 1/3 innings while striking out 2 and walking two. Marquis Fleming recorded his third hold with 2 1/3 no-hit innings, striking out 4 and walking 1. Josh Satow picked up the save, his sixth, allowing 2 runs on 2 hits in 1 1/3 innings to close out the game for the Stone Crabs. The Stone Crabs and Manatees will play game three of the series on Saturday night at Charlotte Sports Park. It ill be a battle of the lefties, Matt Moore (0-5, 6.51) on the mound for Charlotte against Daniel Merklinger (2-1, 4.38) for Brevard County. Check back later this weekend for photos from tonight's game. Do you think Beckham can make a comeback? He has looked good as of recent.